I listed a lot today at Lakewood. This is a 1 acre lot located on Oak ridge road right next to a home that recently sold in Lakewood. That address is 460 Oak Ridge road. This lot is priced to sell at $19,900 and it has lake frontage(but obscured by mature trees). This is a nice building lot with most of the rear part of the lot covered with trees. I anticipate selling this lot pretty quickly because of the location and ease to build on this lot. The house that sold next door has 2567 sq feet of heated area and a walk out basement. 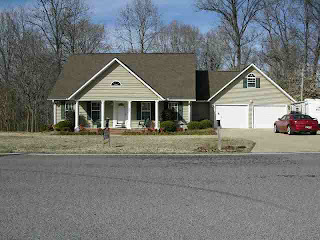 It is located on 1.25 acres and is a 3 bedroom 2.5 bath home. This Lakewood home sold for $181,000 which was a little low but owner had been transferred and owners were really motivated to sell.